Well that is a tricky one! Depends on whether you are King Alfred the Great or the modern Wessex Water Board or anything in between! The boundaries of the region were ever changing over the centuries. language of England, it was the speech of the Anglo Saxons that was superseded by the French Norman England of William the Conqueror. 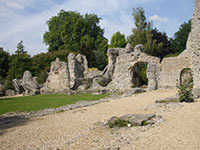 It was the region of the Anglo Saxons with Winchester at one time capital of England and Alfred the Great as king. Or the boundaries when Edward the Confessor became King in 1042. 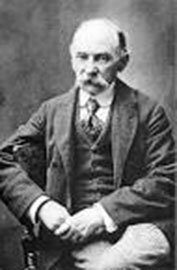 Thomas Hardy considered it to be Dorset, Hampshire, Berkshire, Wiltshire, Devon and Somerset. Hardy was most interested in the concept of a Wessex region. In the modern world there is even a political party, The Wessex Regionalist Party, they want the area to be a region. Their version is Berkshire, Devon, Dorset, Hampshire, Somerset and Wiltshire. The Wessex Society include Gloucestershire, Herefordshire and Oxfordshire as well. The Wessex Constitutional Convention excludes Herefordshire. We will go for the dialect, that wonderful brogue, so well known and distinctive - Devon, Dorset, Hampshire, Somerset, Wiltshire and because of modern geography we will include the Isle of Wight, They might be annoyed however, as with the south of Hampshire they were a Jutish region! So much diversity. Attractive ancient cities and towns. Even more ancient, mysterious standing stones. Quaint, sleepy villages meandering along pretty narrow winding lanes. Misty moorland. 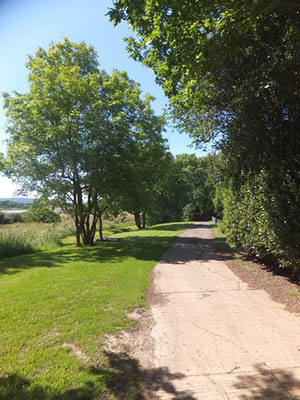 Footpaths, cycle ways, horse trails, all through invitingly beautiful countryside. Farmland, fields, woods and plains stretching for miles. Streams rippling and sparkling in the sunshine. There is the stunning South West Coastal Path that runs for over 600 miles along the coastline. Once a track the coastguards used when watching for smugglers. A walk to do in day size bits! Well worth it! The region may be ancient in time, but it is as modern as tomorrow. As administrative county boundaries change, the counties on this site are the arrangement of the ceremonial counties. 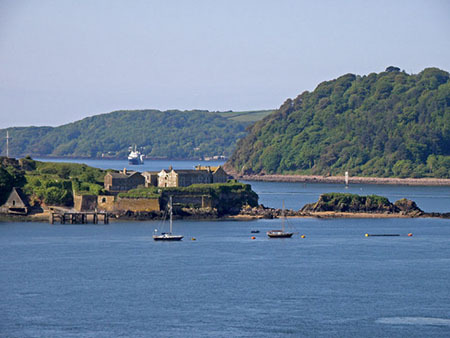 From the rocky northern coastline to the English Riviera in the south. 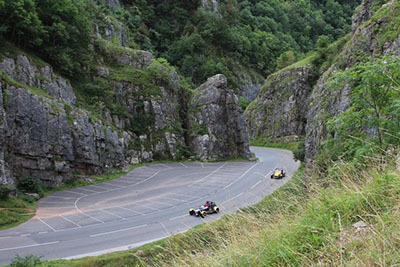 (There is a cycleway, the Sustrans NN27, Devon Coast to Coast, that runs from Ilfracombe to Plymouth - or vice versa.) Mystic Dartmoor with its standing stones. Exmoor to the north of the county and partly in Somerset. Ruby country in between, lovely Devon farmland. 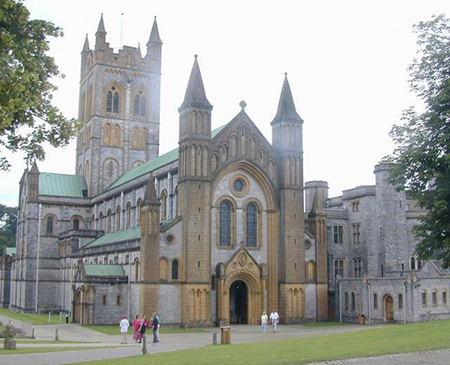 Devon has two main cities Exeter and Plymouth plus a host of small towns each with their own ambience, charm and character. Some along the coast like Torquay, Brixham, and Paignton. Some are moorland towns like Okehampton, Ancient Lydford with its beautiful gorge or Sticklepath of the Fireshow fame. Plus many other towns dotted around the county like Newton Abbot, Teignmouth, Sidmouth, Exmouth and so many more attractive places. An enchanting county. Mostly beautifully rural. Small fields and hedges, winding lanes, pretty villages and towns. Pubs, where you can get a meal, or just a well earned drink. Plenty of footpaths, cycleways and horse trails.The Jurrassic coastline is stunning. Dorchester the capital of the county. Here is Thomas Hardy country for not far away is Upper Bockhampton where he was born. Spend some pleasurable time in the enticing seaside town of Bournemouth and dearly loved Weymouth with their sandy beaches just asking for sunbathing. Or visit Lyme Regis, the Pearl of Dorset. Or maybe Sherborne in the north. In 2012 The Olympic Sailing events were held at Portland near Weymouth. Try the cliffs above Portland for a stunning view. Dorset is a well kept secret, have a peek. Such a beautiful county. Heartbreakingly beautiful. Imagine. Rolling chalk downs, hiding pretty little villages. 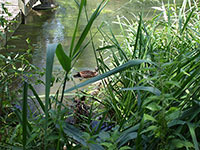 The Test and Bourne streams wind and divide into streamlets through water meadows sprinkled with wildflowers and weeping willow trees watch over the river. Stand on the bridge and feed the ducks. The Itchen, the Stour and all the many magic little streams wandering along giving homes to a myriad of fish, otters, water birds and insects. 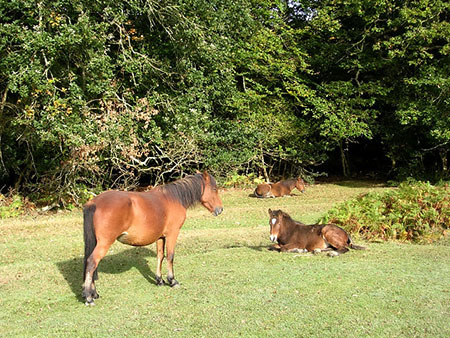 The New Forest, ponies, heathland and forest. Bewitching in its beauty. Lovely Lyndhurst, Ringwood and Lymington. East Hampshire - Petersfield set in an Area of Outstanding Natural Beauty with Alton close by. North Hampshire, Basingstoke, Aldershot, Farnham. The Test Valley with Andover and Romsey as its centres. Winchester the ancient capital of Wessex and England but now the capital of Hampshire. 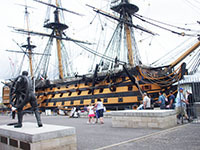 The coastal cities - Southampton a busy port, Portsmouth a naval port for centuries. Eastleigh where Southampton Airport is situated. A microcosm of delight. A miniature world where nowhere is far from anywhere on the Island. A haven for cyclists and walkers with cycleways and footpaths all over. Try the Round the Island Cycle Route. It is 62 miles, but you do not have to do it in a day if you do not want to. Why not spend a week and look at the island properly! 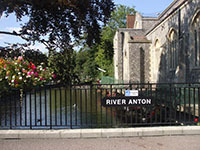 There are events on the island for both walkers and cyclists. 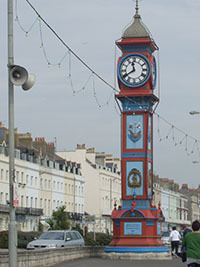 Ryde and Cowes are the gateways to the Island. Cowes is of course home to the illustrious sailing event, Cowes Week. The three attractive seaside towns of Sandown, Shanklin and Ventnor decorate the east of the Island. Lovely sandy beaches ideal for family holidays. Newport is the capital, home to the Isle of Wight Festival at Seaclose Park. You must not miss the pretty medieval village of Godshill, south of Newport. Do not forget the camera! Niton is on the south coast while Brightstone, Brook and Freshwater are along the south west coast. Totland, Yarmouth and Gurnard are on the northwest coast. Another very diverse and most attractive county. Zummerzet where the zider apples grow! The Mendip Hills and the Quantocks. the green hills of Somerset with the Somerset Levels between. 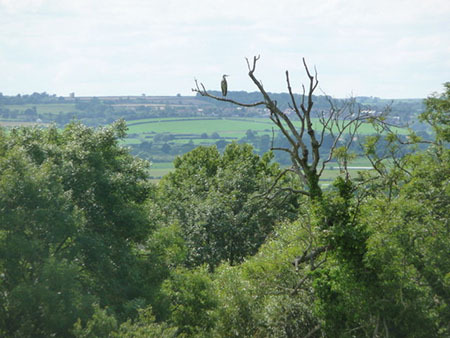 See Blagdon Lake from the top of the Mendips. Chew Lake, a Site of Scientfic Interest. Exmoor juts into Somerset from Devon. Cheddar Cheese. The Glastonbury Festival. So many shades of green. Just a taste of Somerset. Bristol, a large port city, is geographically sort of in Somerset, but lives alone. Bath and Wells, two famous beautiful Cathedral cities. Pleasant Weston Super Mare where the tide goes so far out. The new pier is open. Burnham on Sea and Clevedon also popular seaside resorts. 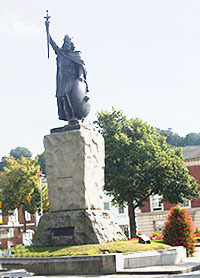 Taunton is the county town and scene of the famous Taunton Flower Show. Bridgewater at the foot of the Mendips. Yeovil, a town famous for its helicopters. Minehead end, or beginning, of the South West Coastal Path. With many other smaller towns and villages dotting the landscape. A county to explore. Perhaps best known for Salisbury and Salisbury Plain. But to leave it at that would be to miss a lot. Salisbury Plain itself is a massive 300 square miles of chalk plateau, well known to many soldiers. The Vales of Avon, Pewsey and Wardourbisect the chalk country. 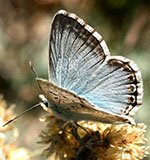 Chalk countryside is the home of the pretty Chalkhill Blue butterfly. Sites as ancient as Stonehenge and Avebury signify the county's mystical prehistoric roots. Attractive Salisbury with its wonderful, spired cathedral is the only city. 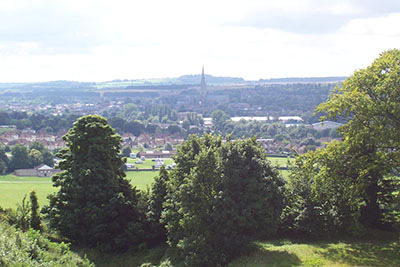 Trowbridge is the county town with its popular Festival. 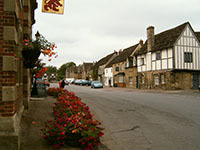 Wiltshire has many other towns and pretty villages. Swindon in the north, a very modern town these days. Chippenham, a market and commuter town in the west. Devizes in the centre has a very large number of listed buildings which make a most attractive place. Warminster again in the west is a pleasant market town and a pleasant shopping area. It has a bit of a spooky reputation being in the centre of UFO and crop circle legends. Pretty Bradford-on-Avon, military Tidworth, Lacock, and Mere, among many others. Why not visit Longleat or Stourhead. Or you might prefer to browse some more. There are navigation buttons above on the left for your pleasure. Enjoy. Lots of them here! From where you want to where you want. National Express run a very good service all over the country. Sometimes just useful to get from the airport to a Wessex location, then hire a car maybe. Quite comfortable and the driver takes care of the luggage! Train Line Ride the Eurostar and visit the southwest. Trains throughout Wessex. For a train or just the local bus try Traveline. Somerset beckons! Explore on foot.